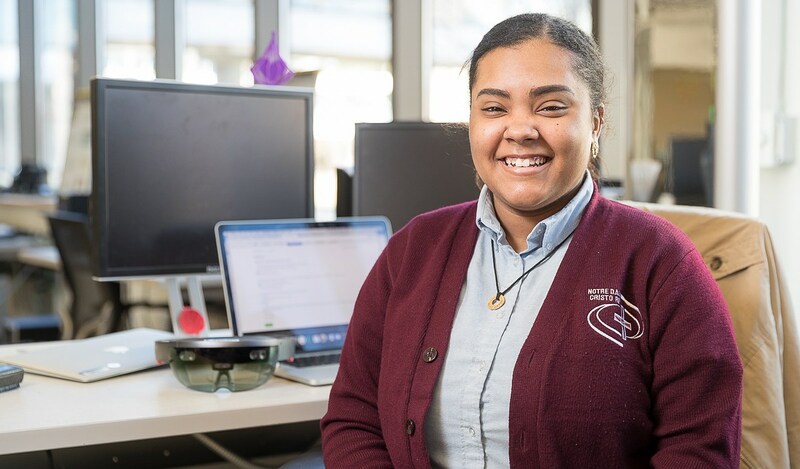 What makes our Cristo Rey model unique is an innovative Corporate Work Study Program (CWSP), through which every student finances the majority of the cost of his/her education. The Corporate Work Study Program places students into entry-level positions and generates much needed revenue for the school. At full enrollment, Cristo Rey Network high schools are able to cover nearly 80% of their operating expenses through the work program and a modest tuition. The students are not on the payroll of the employing organization, but rather are employees of our separately incorporated CWSP. By outsourcing full time, entry-level office jobs through this program, companies enable our students to earn tuition while gaining valuable on-the-job experience. Job sharing teams of students fill 8-hour positions one day per week throughout the school year. Students must complete a training program that includes workshops such as: Phone Skills, Dress for Success, Time Management & First Impressions. For more Information about our Corporate Work Study Program, including pricing, please contact our CWSP Business Development office at (978) 689-8222 EXT 22. Click on Maya's photo below to hear about her experience with Corporate Work Study Partner, MITRE Corporation!